In a large pot, heat the olive oil until shimmering. Add the leek and Poblano and cook over moderate heat, stirring until softened, about 8 minutes. Add the zucchini and garlic season with salt and pepper and cook, stirring occasionally, until crisp-tender, 5 to 6 minutes. Add the chicken or vegetable broth and Parmesan rind and bring to a boil. Simmer over moderate heat until the zucchini is very tender and no longer bright green, about 15 minutes. Puree the soup wither in a blender or food processor or with a hand blender (couldn’t be without mine!) until very smooth. If using a blender, return the soup to the pot and add the crème fraîche and reheat gently, if necessary. Season the soup with salt and pepper and ladle into bowls. 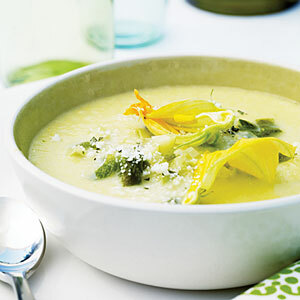 Garnish the soup with cilantro leaves or zucchini blossoms (pictured) and serve. *Crème fraîche is somewhere between yogurt and sour cream. It generally has a higher fat content than either, so its flavor is much richer and its texture is much creamier. Good quality crème fraîche is usually less aggressively tangy than sour cream. *Chile 101: A Poblano chile is a mild chili pepper which is used when dried as “Ancho Chile” or when stuffed for “Chile Rellenos”. The more mature darker green Poblanos are usually hotter and the lighter green, less mature ones are milder. Choose according to your “heat intensity” ability!